This one is not, under any circumstances a quick game, and is likely therefore, to be a long-ish post. The fastest time we’ve ever played it in is an hour, and that’s because we set ourselves a time limit. Otherwise the game could take days. 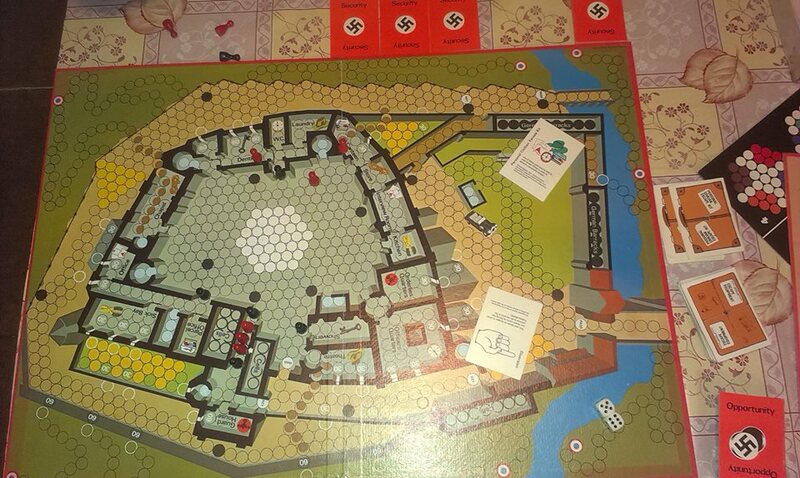 Escape From Colditz is a game set in the World War II prison camp at Colditz Castle. The idea for the game came from a plan formed by a group of British POW’s (Prisoners of War) to escape from Colditz using sheets and floorboards to create a glider. The game itself is a little more complicated than that, but that is the story the game is based on. 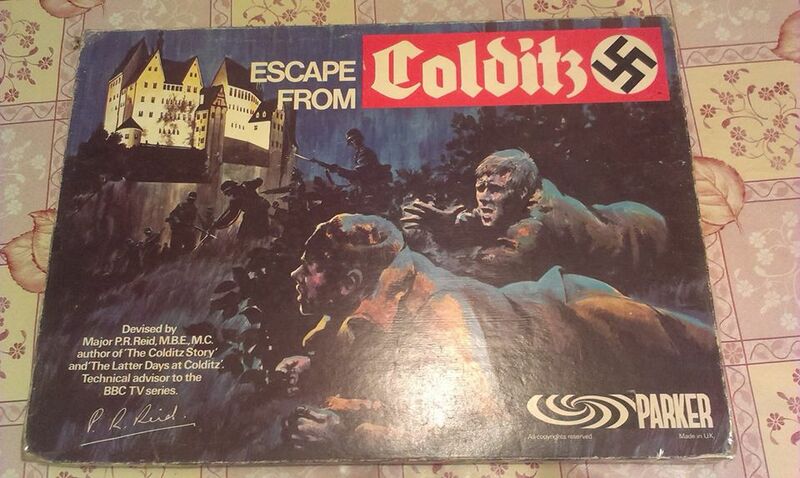 We used to play Escape From Colditz when we were younger, and we never had our own copy of the game. So recently my brother decided that it was a game we definitely needed, and he bought a copy. Since it arrived in the post we’ve played it several times with different numbers of players and different time limits. This game was created by Pat Reid, a British Army Officer, and one of the few to successfully escape from Colditz Castle in World War II. 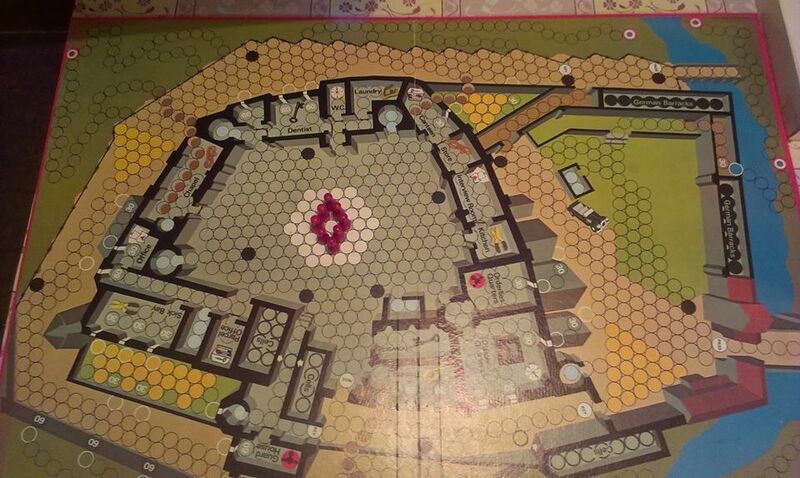 The game is for 2-6 players, and the board is the floor plan of Colditz. The rule book tells us that the board is based on a true plan of the castle, but that was adapted to have all necessary features on one floor. This accuracy to Colditz is one of its most interesting features. The fact that the Guards are always outnumbered by the POW’s is historically accurate, as, during the war, the prisoners always vastly outnumbered the Guards. It was only by the harsh way of living, random public executions, and other similar means, that the Guards were able to keep authority over the prisoners. Pieces are moved by the throw of two dice. A player may use all their moves on one piece or otherwise split the roll between as many of their pieces as they like. They have to move the whole number thrown and they cannot allocate any of their number of moves it to another player’s pieces. A double entitles the player to another roll. There are five packs of cards involved in the game, Personal Civilian Escape kit, Escape Equipment, Escaper’s Opportunity, German Security and Do or Die cards. The Opportunity cards, Escape Kits, Escape Equipment and Do or Die cards are all only useful for the escapee’s, the only cards the Security Officer can use are the German Security cards. To attempt escape, each prisoner must collect an “escape kit”, this consists of food, a compass, forged papers, and a disguise. Once collected this cannot be taken from you or lost in any way. The items collected as part of the escape kit do not exist as escape equipment. To obtain the escape kit the player must get four of their POW’s into the rooms in the castle that have the relevant symbols for each necessary item, they can then claim an escape kit. To make a successful escape attempt each player must also collect other escape equipment, this can be rope, which comes in 30ft lengths, wire cutters, keys and forged passes. Ideally each player would have some of everything. To collect equipment a player must get their POW’s into a room with the symbol of the piece of equipment they want, they must have either two POW’s in the same room, or one in each of the rooms with that symbol, before they can collect the relevant equipment. Start positions if playing with two people. EO is playing as Britain. Opportunity cards are specifically for the use of the POW’s. Likewise with Security Cards, which are specifically for the Security Officer. To collect a Security or Opportunity card a POW or the Security Officer must roll either a 3, 7 or 11. They are then allowed to take a card from the top of the deck before they continue with their turn. Opportunity Cards can be used as soon as they’ve been collected, or they can be held for later. However, each POW or Security Officer can only hold three at any one time. POW’s have an advantage over the Security Officer here, as, if playing with more than two players, they can choose to either discard one of their Opportunity Cards or they can pass it over to another POW. The Security Officer must discard a card if he/she has collected more than three. Opportunity Cards and Security Cards are incredibly useful, an Opportunity Card might provide a POW with a piece of equipment, or allow them to hide from the Security Officer at some point, it may even allow them access to a tunnel, which will aid their escape attempt. For the Security Officer, Security Cards are a little different, they may allow you to search a room (the SO cannot enter any of the rooms in the castle without the relevant card giving them permission to search it, meaning that POW’s are generally safe whilst in the rooms), or call Appel, which recalls every players pieces to their starting position, and other similar things. A Do or Die card is dealt to every Escape Officer at the beginning of the game, these are not read and are kept face down until they are used. Once an EO has decided to use their Do or Die card, they then turn it over and read it. It will tell them how many rolls of the dice they have to try and get one of their prisoners out of Colditz. The prisoner starts from anywhere inside the grey area of the board (the inner courtyard) and must reach one of the safe targets outside of the castle walls within the number of throws specified. The prisoner must leave through the main gate and pass and key points no longer effect them. If the prisoner does not manage to escape, they are “dead” and their whole team is removed from the board and from play. There are even more rules to this game than i’ve mentioned in my brief (haha) overview here, however, you can gather the general outline of the game. It’s quite strategic, and definitely a challenging game for anyone! We thoroughly recommend it for hours of fun, we played the other evening and had a very silly argument, that anyone who has either of us on facebook may well have seen, about whether or not I, playing as the SO could continue to shoot one of his escaping prisoners if he was playing a diversion card (one of the Opportunity Cards). I said no, therefore I won. He said yes, which would mean he had won. This argument has no resolution so far. All the information presented to you here came either from our experiences of playing the game, or from the rule book itself, if you’re interested, go find a copy!